Hurray! A comedy hour at the Edinburgh Fringe that has one overarching theme, clearly associated with its title, and sticks to the point without meandering off in all sorts of different directions. 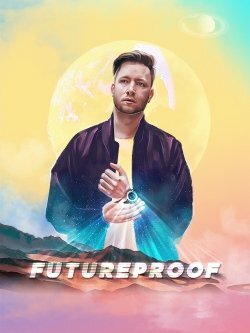 Marks for Dan Attfield for coherence, which shouldn’t be a differentiating factor, but as far as comedy at the Fringe goes, it sets his show, Futureproof, amongst the best. Here’s the premise – there are ways to ‘futureproof’ oneself, to prolong one’s time on earth. Some people may not wish to do this, but for those interested, even out of curiosity, Attfield provides a list of actions that can be taken, loosely based on ‘A Short Guide To A Long Life’ by Dr David B Agus (the antithesis publication, ‘A Long Guide To A Short Life’, is not value-for-money). One involves “becoming Japanese”, as life expectancy is higher over there than anywhere else. Another is to eat broccoli, which Attfield decided to demonstrate by eating raw broccoli on stage, before one of the longest pauses I have ever encountered at a comedy show, justified by not talking with his mouth full. The use of multimedia was good, with a number of images to supplement the narrative. On one level, it was just a PowerPoint presentation. On the other, it proved very useful. Attfield is a composer – playing his trusty guitar, there was more live music here than there is in some Fringe shows under the heading ‘musicals’. For the most part, this was, to be precise, sit-down comedy, as opposed to stand-up, mostly because of the logistics of the performance space, though some lovely interaction took place in an improvised number about decluttering. Getting rid of things and simplifying one’s life is another way of increasing longevity. At the performance I attended, a gentleman said he wanted ‘kitchen stuff’ cleared out from his home – I presume this is a reference to old pans and pots no longer in use. But the best response was from a young lady called Julia, who wanted to get rid of ‘writing utensils’. Naturally, Attfield wanted to probe this a little further. She had ordered a pen online for next day delivery, but this turned out to be a box of fifty pens. Later, Julia was called upon to play a harmonica as best she could (as ever with shows of this nature, sit in the front row at your own risk), as Attfield somehow managed to get her degree title into a song. The exact title was so long I don’t recall it, but it was something to do with construction and the built environment. Indulging in sexual relations is yet another way to prolonging one’s life, which makes sense, while other strategies, like ‘finding your tribe’ rather less so, though a post-show Google search reveals that ‘finding your tribe’ is about joining a group, formal or informal, with whom you have common affinity – anything from Mensa to a knitting circle. A rather cute ditty incorporating numerous London Underground station names, about the feelings of love for what is now Attfield’s ex-partner, was priceless. Attfield is not so self-indulgent as to say so, but I suspect attending comedy shows would contribute to living long too, or at least finding some way to laugh regularly. Attfield has a friendly and welcoming approach, and while I don’t share his appreciation of the British boyband Blue, there were some points to ponder in this intriguing and persuasive show. The first human to live to a thousand years old has allegedly already been born. Dan Attfield is determined to make sure it’s him. Combining his love of all things nerdy with multi-instrumental musicianship, Dan attempts to extend his life expectancy, while failing to meet his unrealistic life expectations. As a solo act, Dan reached the semi-finals of the 2016 Leicester Square New Act of the Year and 2017 South Coast Comedian of the Year competitions, and brought his debut solo hour, Google Drive, to both Brighton and Edinburgh Fringe in 2017. As a part of hip-hop freestylers Abandoman, YouTube sketch team The RH Experience, and multi-festival hit show Amusical, Dan has performed at Glastonbury, Latitude, Machynlleth, Leicester, Reading and Leeds Festivals, as well as featuring on BBC One Northern Ireland, E4 and BBC Radio 4.